After going thru' the Demands of Tumkur MP Mr G S Basavaraj, last week for Rail Budget 2011, decided to approach him for the Commuter Rail as Tumkur and Bangalore Railway Track is already double except electrified. We called his office and provided Tumkur MP with all the information relating to Commuter Rail with copy of report. Finally we got an appointment at very short notice to meet him on 26th evening at His Office Tumkur. Sathya and myself went to Tumkur to meet him on 26th evening, Naveen could't make it due to his other appointments. Both of us decided to visit the Tumkur Station before meeting Mr Basavaraj as his Office / House was very close to Tumkur Station. This station is perfectly placed to provide Terminal for Commuter Rail with sufficient land available for expansion. Both of us interacted with Mr Basavaraj team : Mr T R Raghothama, Sheetal and Mr Ramesh. Raghothama is retired DGM from KPTCL and follows the actions in Praja related to Commuter Rail. He is well aware of the Commuter Rail proposal from Praja and also he is helping MP Mr Basavaraj on the developments required specifically related to Railways for Tumkur Dist. As the demands of MP for hourly train from Tumkur to Bangalore with electrification is nothing but the Commuter Rail concept, which will benefit both Bangalore and Tumkur. We explained to him about the Commuter Rail segments in detail and how Tumkur to Bangalore can take off soon if their MP makes effort at center with Railway Minister. Finally both of us could able meet MP Mr Basavaraj at 6 PM. We explained him about the Commuter Rail and status of the project. He agreed to take up the issue at Center with Railway Minister before the Railway Budget. It looks for us, he can make the things move in positive direction further as he has done lot efforts with SWR & Railway Board to move the projects related to Tumkur and Bangalore. Specifically the Electrification between Tumkur to Yesvantpur project. His office has followed the progress of the Track Electrification project with concerned SWR offices and now DPR has been completed by SWR with RoR 12 to 15% and project has been sent to Railway board for approval with estimated budget of 56 crore. This has really impressed us, how MP can make difference by follow up with projects even Center is not taking much of interest for Karnataka projects. After discussion with his office staff, it appears that GoK has not written any letter to Railway Board or Railway Minister except the correspondence with GM / SWR Hubli only. It was good meeting and worth going all the way to Tumkur 70 Kms and enjoyed the journey thru Elevated Access controleld Highway from Yesvantpur to Nelamangala, tolled high way betwen Nelamangala to Tumkur with Sathya's Honda city. Came back to Bangalore by 9:30PM with futher hopes. If any thing missed out, request Sathya to update. Thank you Mr. Basavraj, MP and your team! Submitted by kbsyed61 on 28 January 2011 - 1:30am. Thanks for updating PRAJA with your trip to Tumkur to mee the MP Mr. Basavaraj. Thanks to MP Mr. Basavaraj and his team for giving us an opportunity to personally meet and discuss CRS proposal. As SB had said earlier, it is really mercenary efforts from you guys in taking time off from busy schedule and traveling all the way to Tumkur to meet the MP and plead our case. It seems nothing has really happened after that Chief Secretary's meet. Also I cam to know that the GOk Minister Mr. Janardhan Reddy has written a letter to all the Karnataka MPs to support this project with Railways. Is that true? How can we get the GOK CM to endorse this project and send an official request to Ministry of Railways asking for the CRS? Submitted by Vishy23 on 28 January 2011 - 2:17am. Can i suggest u one more thing before this all important budget..Please meet Anantkumar, DB Chandregowda n request them to prevail upon MoR. Submitted by Vishy23 on 28 January 2011 - 2:22am. forgot to add H.D.Kumaraswamy's name...please try to meet him..because i have never heard him demanding anythin of these..Seems, Devegowda family is not interested in state development, rather they have ample to fight NICE n BSY..Thanks. Submitted by Ravi_D on 28 January 2011 - 9:30am. What a commitment..... Leading by example. Submitted by Sanjeev on 28 January 2011 - 12:21pm. Myself had met the Bangalore south MP during last year and update him on the actions of Commuter Rail and even sent mails to him about non-progress from State & Railways on this, looks like he is too busy at National level and their is no time for his own area and Bangaloe. Seems, Devegowda family is not interested in state development, rather they have ample to fight NICE n BSY. These 3 MPs from JDS r not even raising theri voice for Bangalore to Hassan line completion, as u mentioned, its true with them. Also I came to know that the GOK Minister Mr. Janardhan Reddy has written a letter to all the Karnataka MPs to support this project with Railways. Why GoK CM & this minister r not writting letter to Railway Ministe, MoS K H Muniyyappa & Railway Board???? why they r asking all MPs to support, when the concret project demand itself has not gone to Center. Why Mr Reddy is not disclosing the same to Public ??? Submitted by Vasanth on 28 January 2011 - 1:45pm. Sanjeev, IDS - Appreciate your commitment and dedication of your time for the same. Submitted by silkboard on 28 January 2011 - 1:57pm. Good show going all the way to Tumkur to push for Namma Railu. Everyone must appreciate the time you are putting in on this. From my side, a meeting with MP Mr Rajeev Chandrashekhar is still on the cards. Had I n ot missed a phone call earlier in the week, it would have happened today (Friday) itself. Now expecting it to happen next week (would be at a short notice). Mr Chandrashekhar being from industry himself, I am hoping he will have some ideas on exploring the PPP angle on Namma Railu. Submitted by idontspam on 30 January 2011 - 10:44pm. 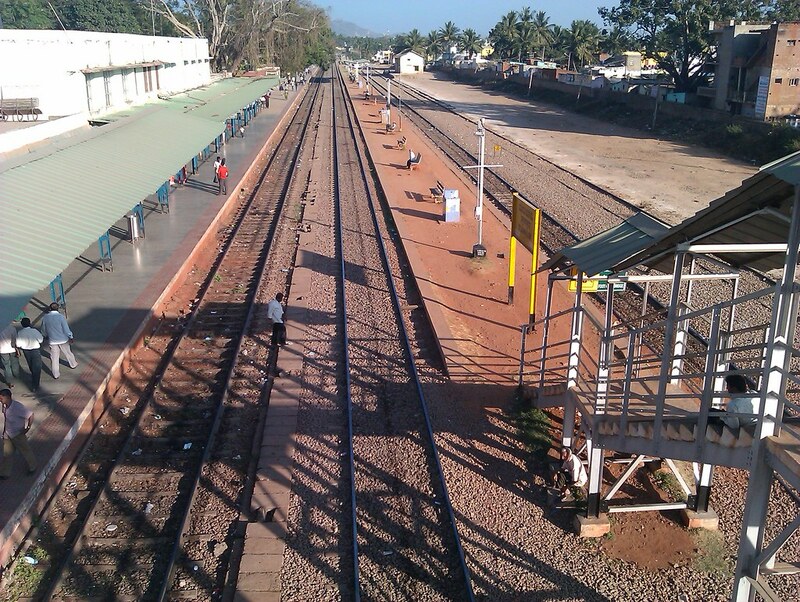 Here are the shots of the Tumkur station, as you can see there is scope for 2 more platforms on the right of this pic. There is also a line terminating to the left of the below pic at the end of the platform where the sheet roofing ends & the trees start. which can be used for an EMU commuter rail post electrification. The station does not have a single display to show train timings. As a result we had a couple of people approach us asking for the next train to Bangalore and Arsikere, they then had to stand in a long ticket counter line to make the simple enquiry. CRS figures in the list of Delegation of MPs! Submitted by kbsyed61 on 31 January 2011 - 4:36am. Your trip to Tumkur on Jan 26 will not be going waste. This what the "Deccan Chronicle" says quoting MP Shri. Basavaraj, who will be leading a delegation of of Karnataka MPs to the Union Government soon, to pressurise it over implementation of delayed railway projects in the State.to present the railway demand of Karnataka State. "...The delegation of MPs will demand the commissioning of several other projects including a railway service for commuters by introducing Special Purpose Vehicle (SPV) from Bangalore connecting Chikkaballapur, Doddaballapura, Yelahanka, Baniganahalli, Bangarpet, Hosur, Ramanagara, Nelamangala, and Tumkur..."
Source - The Hindu "Rail projects: State MPs to meet minister". Submitted by silkboard on 31 January 2011 - 9:22am. Way to go! Its on the radar of MPs now. Exactly the way it should be, an SPV for Commuter Rail Service to connect the peripheries!!. Wish we could have pushed a name for this demand as well (Namma Railu, or Bangalore CRS). Submitted by Sanjeev on 31 January 2011 - 10:26am. Its good efforts from Namma Railu Praja Team. We should get this project in this coming Railway Budget. Thanks to MP Mr. Basavaraj and his team for taking this forward. Now most of the Mps of Bangalore & its surrounding are made aware. Now they should get the project approved. Efforts from Praja on Commuter Rail should realise. Thanks to Syed for updating this information. Submitted by dvsquare on 31 January 2011 - 10:57am. This is really a great effort by the team here, thanks. Submitted by Sanjeev on 3 February 2011 - 6:31pm. Our MP's should take interest the way Mr Basavaraj Tumakur MP has taken for Railway projects. We have total 7 MP's ( 3 MPs from Bangalore Urban, others from Tumkur, Chikballapur, Kolar, Manday, Bangalore Rural ). Other three RS members from Bangalore also should put pressure on center so that Commuter Rail project will get approval from center. Submitted by Sanjeev on 3 August 2016 - 2:07am. 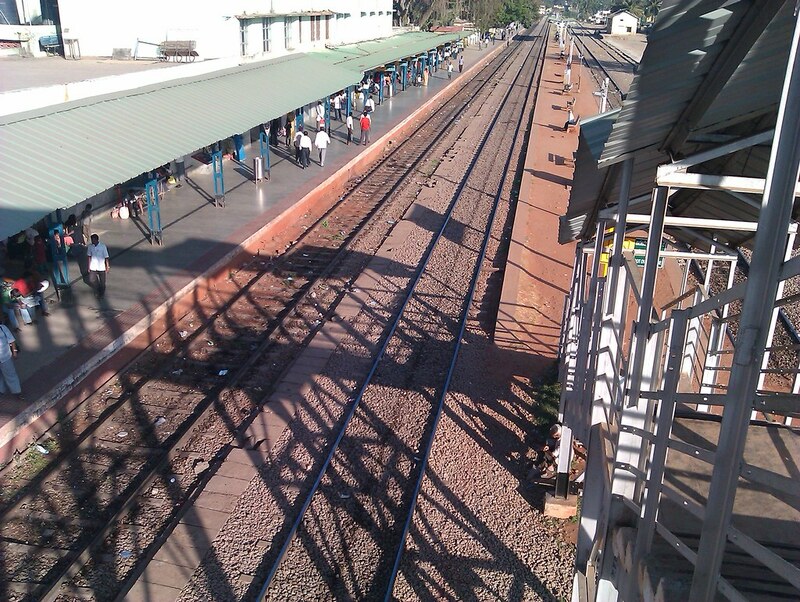 Tumkur Ralwat station getting exclusive Suburban Rail Platforms.